Start by drilling holes in the top back of each piece of wood. 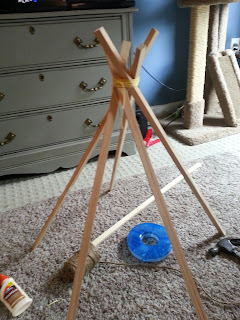 That way you can run twine through all of the pieces to hold them together. Begin by wrapping the twine around many times to keep the pieces together. I used twine and yarn just for looks. Then start with your fabric. The first few pieces can just be glued and wrapped around as many times as you prefer. 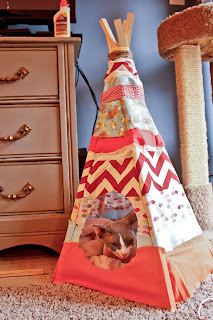 Once you get down a few inches you will need to glue the pieces of fabric in pieces. This part is a little tricky. You have to almost do each section between the poles. Glue, Cut, Glue, Cut, and repeat! 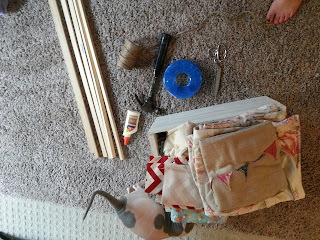 Wrap each piece around of fabric around the wood, glue and cut. 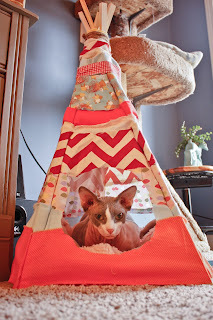 I wasn't concerned with making the inside of the teepee too perfect since I don't think Indilwen would mind! :) Don't be too concerned with getting each piece cut exactly straight or gluing perfect. It's suppose to be fun and very handmade. If you are a perfectionist this is definitely not the teepee for you! Once you have done the entire thing, take a pair of scissors and cut the hole for the opening. Melissa Welch was born in Missouri but grew up in Georgia. Growing up in a creative family allowed her to follow her dream of working in the fashion industry. After visiting the Savannah College of Art and Design in middle school while her brother was attending the college, she knew that was the place for her. In her time at SCAD, she completed several internships in multiples fields including, a visual merchandising internship at Anthropologie, an internship with the photography department at Turner Broadcasting, and a styling internship with a celebrity stylist in Los Angeles. After graduating from SCAD in 2012, she is currently managing a full time job of running a home and garden shop in Atlanta, as well as working as a wardrobe stylist. On a personal note, she is completely in love with her Sphynx cat, Indilwen and also loves antique shopping, vintage rings, watching every movie ever made, painting furniture, and crafting all day, everyday.